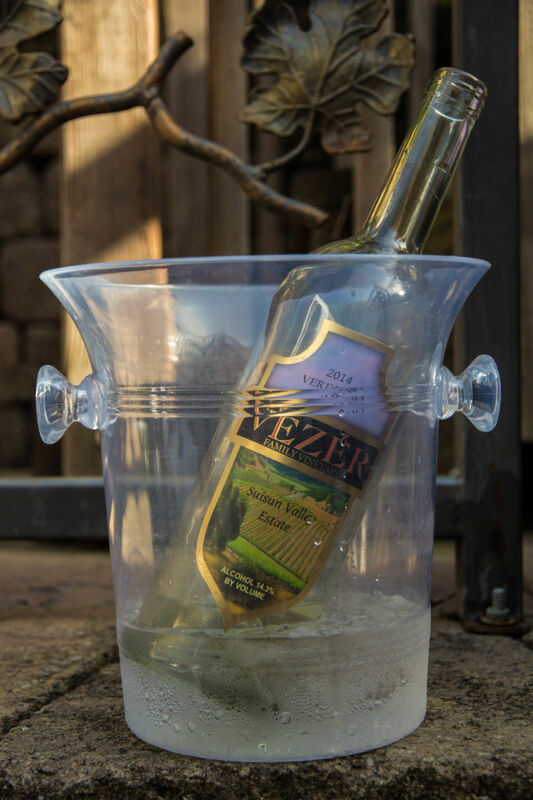 Every year Vezer Family Vineyard hosts a summer concert series in the gardens of one of their gorgeous properties. Prices are more than reasonable and a great time is had by all who attend. There used to be one day of a big concert and several smaller concerts, but they have decided to spread out the fun and split it into concerts throughout the summer. They call their concerts “VezerStock”. In years gone by, people used to dress up in 60’s costumes and join in the fun. It was hilarious to see what people showed up in. They still have dress up events, but sadly this concert wasn’t one of them. 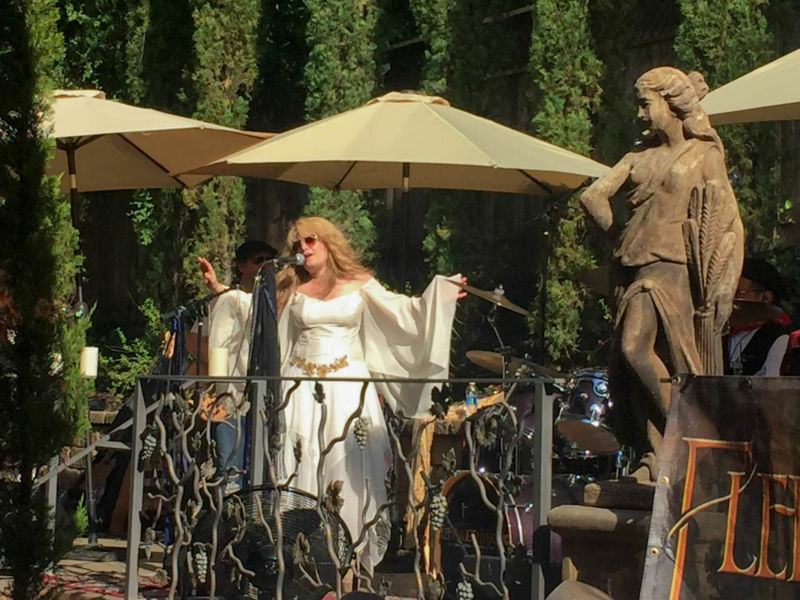 Our first concert that we attended this year was held at the Vezer Family Vineyards tasting room in the gardens. They had set up tents and shaded areas to block out the sun and provided food and, of course wine, for purchase. The band was called Fleetwood Mask. They were phenomenal. A true cover band of Fleetwood Mac; these guys and gals sounded like the real deal. 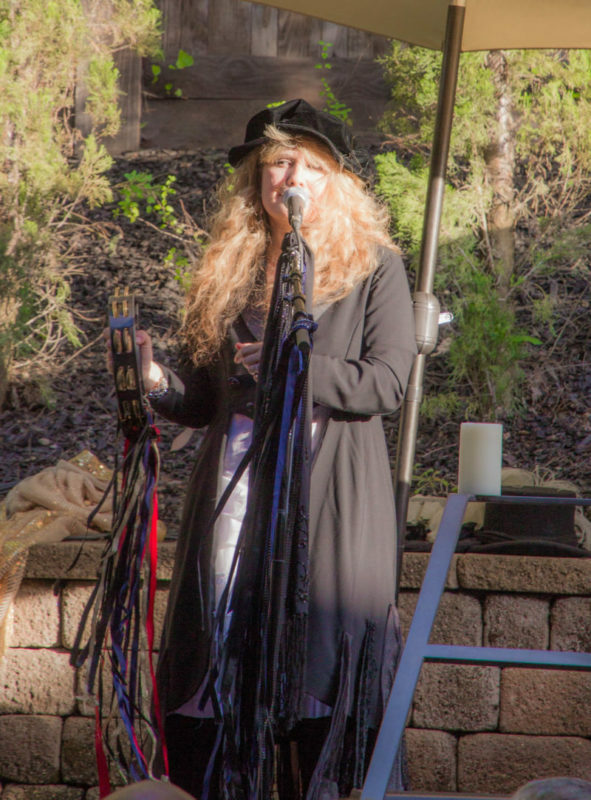 The lead singer even looked and acted like Stevie Nicks. I have seen other bands where the front person/singer may look like the person they are impersonating, but none had such a close sound. They had the crowd up dancing through most of the show (the sign of an awesome band). I have to admit that The Brit and I were up dancing too. The Brit Comments: Stevie Nicks’ distinct voice would not seem an easy one to emulate, but the singer had it off pat, but it felt natural and not a forced impression. Despite the heat of the day, she wore layers of clothes, with loose swirling capes that added visuals to the auditory authenticity. The band played the songs well. My one criticism was that they did not play the extended instrumentals for The Chain. I am happy that California Girl described my awkward gyrations as dancing. Mankas Corner Steakhouse did the catering. They provided burgers, steaks, salads, cheese plates, and desserts of chocolate chip cookies and strawberries. 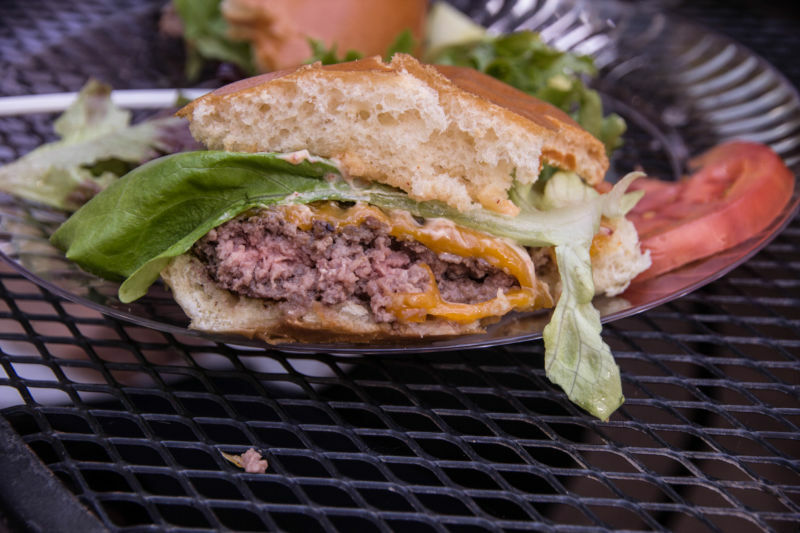 As some of you know, I am not a fan of this restaurant (click here for our review), but I have to give them credit that the burgers were nicely done; they didn’t over season them and they were cooked beautifully. They cost $20 for a cheeseburger with no fries and just dressed lettuce, but I was really happy with the quality. 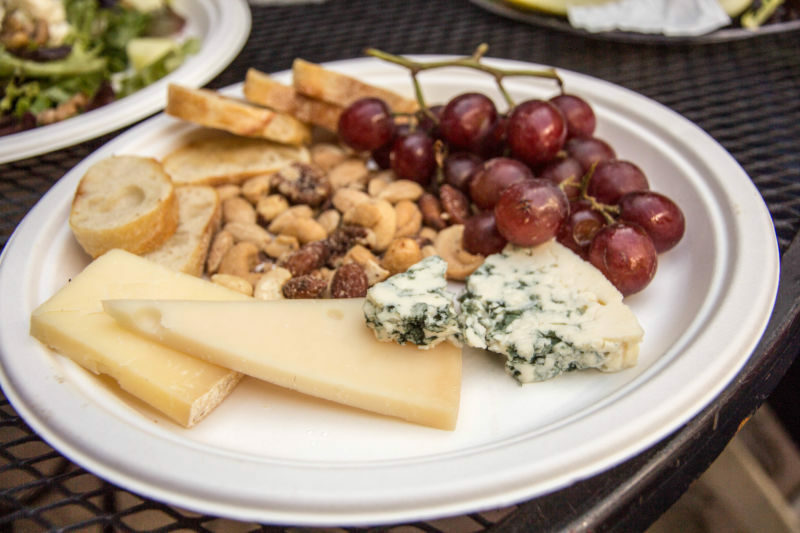 The cheese plate too was very nice for $15. Our entire group was happy eating. They also managed to deliver our food quickly and it was all hot and fresh. The Brit Comments: The absence of excessive seasoning allowed the quality of the meat to shine. Since we shall be going to further concerts in the series, I hope that this serving was not an aberration. For the wine, they served the Verdhelo, which is one of their signature whites. I was so happy to see that the 2014 vintage has returned to the quality of the past. It’s a wonderful, easy sip, perfect for barbecues and concerts. We bought 2 bottles of that for our table. Priced at $35, we really love this wine. 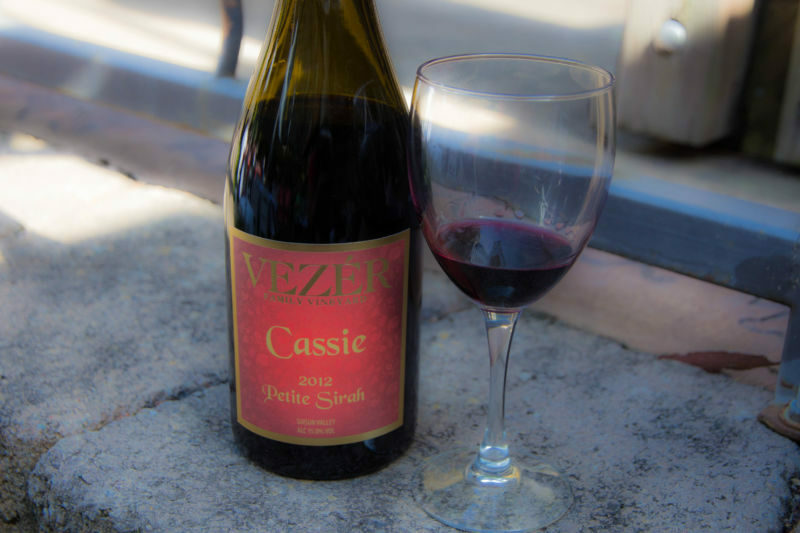 We also managed to get our hands on a bottle of the 2012 Cassie. Even though I am not a Petite Syrah fan, this wine really has my heart and I so enjoy the fruit-forward richness it provides. Everyone at our table agreed. At $49 per bottle, it isn’t inexpensive, but it is a quality wine. 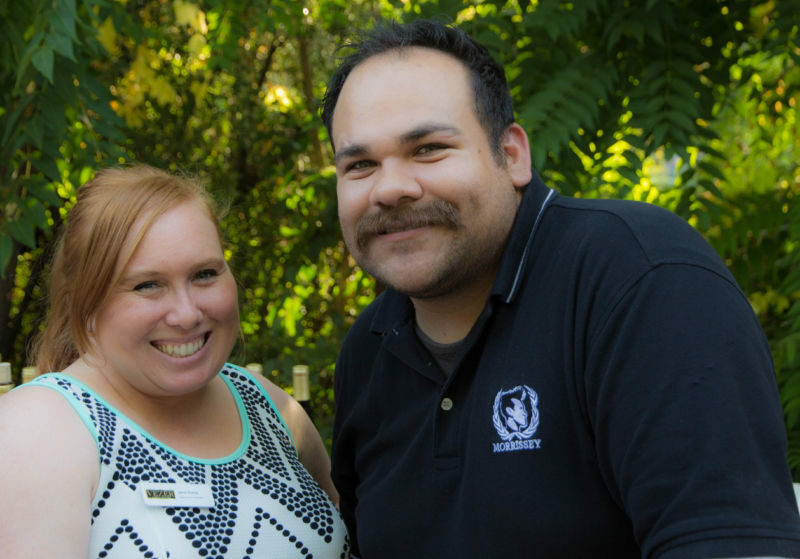 Alex and Jaime… such cuties! One thing I love about Vezer is the staff. They are so welcoming and warm each and every single time I see them. They work so hard at these events and it was nice to see some of them enjoying themselves. I am really looking forward to the next concert in the line up: Boston Rocks on June 11. Tickets are on sale now! You can buy them here: http://www.cellarpass.com/vezerstock-concert-series-boston-rocks-tickets-1163?w=1 Hurry up and grab them as they do sell out. I would also suggest you get to the venue at least 1 hour in advance to get good seats and parking. All Seasons Bistro, Calistoga, Ca.